B2B marketing is functioning in an increasingly fast-paced and complex business landscape, with a wealth of new technologies, tools and channels, and where customers are more in control of the buying process than ever before. With the imperative to become 'digital', B2B marketers have become consumed by the marketing activity itself - the tactics - instead of the outcomes marketers want and need t… o achieve for customers and businesses. B2B Marketing Strategy provides fresh insight into the challenges marketers are facing in such an environment and offers a new framework for developing B2B marketing strategy and plans. 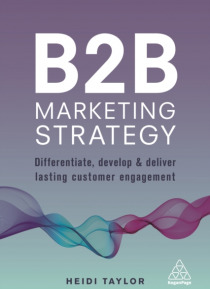 Written by an internationally recognised and award winning senior marketing strategist, B2B Marketing Strategy is a thought-provoking and comprehensive exploration of the state of B2B marketing. Expertly examined, this book will challenge the perspective of B2B marketers by confronting and refuting the many fallacies that currently dominate the industry. Filled with real-world case studies and practical, actionable insights, B2B Marketing Strategy takes the reader through three phases of thinking, doing and being different in order to make B2B marketing memorable in the hearts and minds of customers, creating lasting customer engagement.